There is only one problem with planning a wedding in Great Britain. That is making the decision as to where to host it. With so many beautiful places to choose from it can create a challenge. One such place that many have chosen without regrets is Forde Abbey. Forde Abbey is a licenced facility for being able to conduct civil ceremonies. At this location one can choose to go through their exchange of vows in one of two rooms. There is the Great Hall. Also, there is the Monks Refectory. This is a stately looking room that is exquisite in its decor. It is filled with rich oak panels and tall windows. For those that need to have room for up to 200 guests, this would be a good choice. It is considered to be appropriate for weddings at any time of the year. During the summer the windows allow for plenty of light. For winter wedding the cozy ambiance is created with the lit fireplace that provides a wonderful touch. Not everyone wants to have a large wedding. 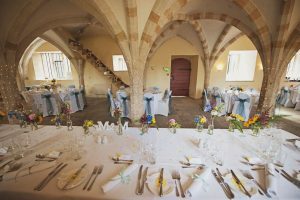 For those that have chosen to have a more intimate venue the Monk’s Refectory is perfect. It can accommodate up to 80 guests. For those wishing to take their vows in the Chapel they certainly can do so. It will accomodate up to 100 people. The entire event can start off with a champagne reception. Here guests get to relax and enjoy the refreshments and tour the grounds of Forde Abbey if they wish to do so. Guests are going to expect some fine cuisine and they will not be disappointed. It will take place at the Undercroft. Then following this will be an evening of dancing and socializing. For those looking for the ultimate wedding this is certainly a venue that will not disappoint them.